Like any other people who couldn't live without a cup of coffee, well this is a great time for you/us to indulge one of our favorite coffee, from McDonald's because they have this promo called Espresso' Clock. 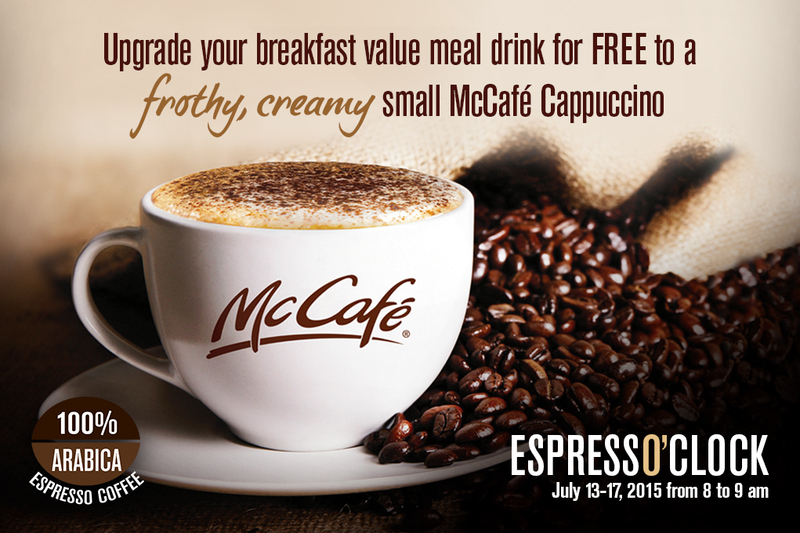 For the month of July, McDonald’s is offering the customers more reasons to live each day with the Espresso’Clock promo. All we have to do is to purchase any breakfast value meal from 8:00-9:00 AM to upgrade your meal drink to a Small (8oz.) McCafé Cappuccino – for FREE! The creamy, rich espresso drink topped with hot frothy milk and sprinkled with chocolate powder is just a perfect treat to make our day extra celebrating and living. Don’t miss out on this special promo, which will run from July 13-17, 2015 at select McDonald’s stores nationwide via dine-in and take-out. Enjoy your favorite McDonald’s items, McCafé’s brewed, espresso, and specialty drinks like McCafé’s signature Premium Roast Coffee, Espresso, Americano, Cappuccino, Café Latte, Iced Coffee, and Iced Mocha – all made with 100% pure Arabica beans and blended to perfection. Loving this month’s coffee upgrade? Share your McCafé Espresso’Clock experience on Facebook, facebook.com/McDo.ph, or tag @McDo_PH on Twitter or Instagram with #EspressoClock. For more information, visit www.mcdonalds.com.ph.